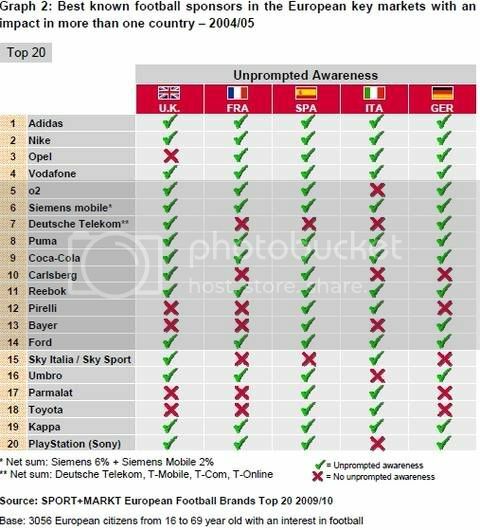 Adidas, Nike and Puma are the best-known football sponsors in the five largest European football markets according to a new study by sports marketing firm, SPORT+MARKT. The European football Brands Top 20 of 2009/10 survey was conducted with over 3,000 European football fans. “Jersey sponsors and kit suppliers dominate European communication in football“, says Hartmut Zastrow, SPORT+MARKT Executive Director. To him, Adidas is the major football brand in Europe. However, Zastrow is most surprised by Audi, in eighth position. However, another reason for Audi reaching the top ten was press coverage of the company‘s purchase of shares in FC Bayern Munich says SPORT+MARKT. 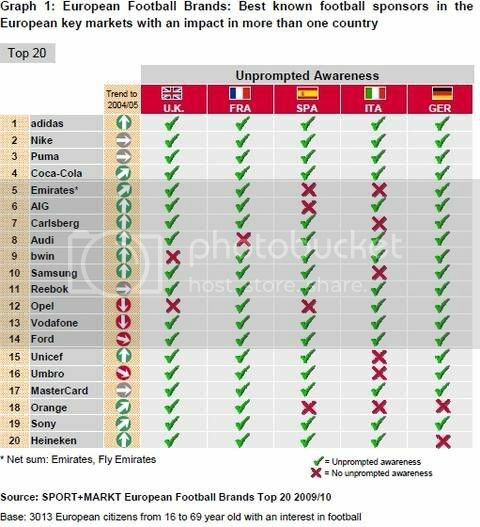 The firm claims that the top twenty illustrates that there are highly varying sponsorship strategies European companies can use to gain the attention of European football fans. A global group such as Coca-Cola is ranked 4th and is omnipresent as a sponsor, in football and sport in general, although it has no jersey sponsorship engagements. Emirates are next, ranked 5th and, in contrast to Coca-Cola, do have jersey sponsorship partnerships with top European football clubs and an engagement as naming rights sponsor of the stadium of Arsenal FC; furthermore, Emirates is a FIFA World Cup Partner. Meanwhile Carlsberg, in 7th place, has been jersey sponsor of Liverpool FC since 1992 and is also partner of the UEFA European Championships, as well as partner of the UEFA Cup until this summer . This puts Carlsberg ahead of rival Heineken, which employs a single engagement in the UEFA Champions League. Do you agree with the list? Who are the up and comers you'd expect to see in five years? Here's the full list of Top 20 brands, and a repost of the list from five years ago below that for comparison.